kb: So far, I have reviewed through move 120.
: May also be at . : Feels wrong to me. I have seen a professional game that played this move, but since both Black stones are on the star points, Black should not go directly for territory so early. Furthermore, does much to undermine Black's territory here. Black should instead play at a, a more positive global outlook. : Probably better at b, but this move is also OK. White has a large corner, so keeping the game small-scale is good. : Tries too hard to make a moyo. Better at any of a. I would prefer the two-space high pincer, because the Black formation at lower left is solid and low. : Slow! Must attach on the outside of . : Good move. Since Black has placed so much importance on the lower side, this both defends the cut and inhibits the size of the territory. : If any move could be called the losing move, this might be it! This move is much better at any of , or . If it was me, I would probably play b in an instant. Locally, this is also the correct move. : Better one space left, or directly at c to both take territory and reduce the value of a White move at the top. : Good. May also play a, which then gives an excellent follow-up at b.
: Should push one more time at a, making a thick shape here. Regardless, is too far and should be at b, to make a stable connection with . : Good move, takes advantage of the looseness of . : Because of Black feels obliged to defend here. : A little heavy, also not severe enough. Should be at c, threatening d.
: This group is difficult to attack. That being said, the best move locally is e, the vital point of White's shape. If one is unsure how to attack, the best thing is to leave it for later. Defending territory at f is also OK.
: Excellent follow-up as well. : Passive, but at is a scary variation and likely bad for Black, since there is no ko threat large enough. See variation. : This move actually helps White get thicker, but there is not much choice. Black may also consider playing directly at a.
: Passive, and makes no points at all! Play at a to take territory. The White group is much more resilient than this. This gives Black a chance to catch up. : Now that is in place, this move has less value, as it doesn't gain much more than is already Black's. Sliding into the corner with b is best. c is not so good here, because White can sacrifice the corner, cut off and swallow it. See variation. : Deep, and also unnecessary - this moyo cannot grow any bigger. Besides, Black's territory is not that large because of the stones. a is still bigger. : Good, but it's hard to gain much, since the White group above is rock solid. That's why - doesn't gain much, as combined with even a stone at only gains 8 more points, and sacrifices opportunities on the left side (for instance instead of , playing at d). However, it is still better to play at b, since attacking won't gain much. : Loose. Better simply to tenuki, since it's not certain how to attack these two White stones. : Better at . This move just contains, and allows White to live in this area. See variation. : Probably better at a - still threatens to get out or live inside. : Loose again. Better one space lower at b.
: Really strange move. How about c or directly at ? : Slow. Continue to attack and make yourself thicker in the center, as these stones are looking weaker. : Exposes the problem of - now Black is obligated to defend again. : Cut, then extend to a, then play at . Make Black run the weak group in the center as well. - : ???? I couldn't believe this when I saw it! Especially , what does this move even do, besides give up on the center stones? How about at a, forcing White to play at , then b. 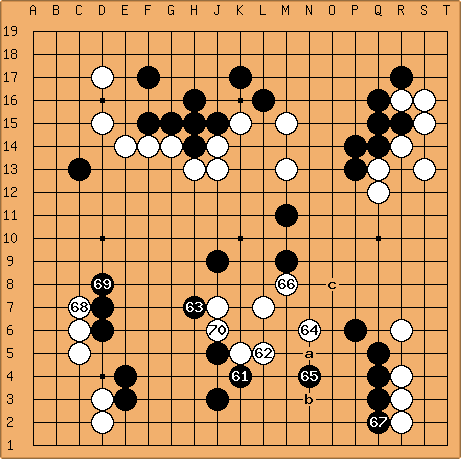 White then has two weakish groups versus Black's one. Bass: I am not sure I follow you. After black b white will of course connect the two stones to the upper white with . Which white groups would you say are weakish? To me it seems the single black stone is cutting healthy white groups apart, so its proper destiny is to get sacrificed. If only someone had suggested a black play at immediately, or at least after ..
: A little soft (see variation for B53). : Better directly at . : Locally, better one point lower at a. If b, then Black can fall back to c, making miai of and d. However, Black should defend the top side territory first at e. It is larger (Black can only save the stones anyway). : Should be at - gives Black one more move on the outside. Add a second stone and sacrifice both. : Better one space right of at a.
: Much too small. Can play a-c as in the game later, or d.
White came out ahead here because this play makes Black almost no points. , , : Should all be at - it is the vital point for the two unsettled groups' bases. unkx80: Question - if at , then how to answer black a? : Black is in a tough position. Stay tuned for the variations! If Black plays at a, then only helped White (b captures). Therefore, Black needs to find a ko threat, but White can pretty much ignore anything on the board and play a, then c, which is worth at least 40 points. None of the ko threats at k are worth that much. Answer to Bass - how to handle the stones in the middle? kb: ...White can secure the central group with this sequence, but yet again puts the pressure on the group created when White decided to cut with . kb: I'm certainly not saying that Black has the advantage here -- I think it was clear from my comments that Black handled White's reduction poorly in this area -- but that Black can more adeptly use the central stones to gain an advantage. From the actual game variation, Black gained only 2-3 points more territory in exchange for making White's group impossible to kill and giving up the central stones. 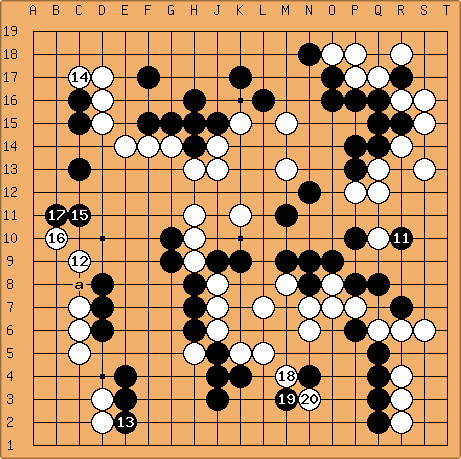 Bass: Let's assume for argument's sake that white just connects at G12, so that we have the same number of moves in both variations. 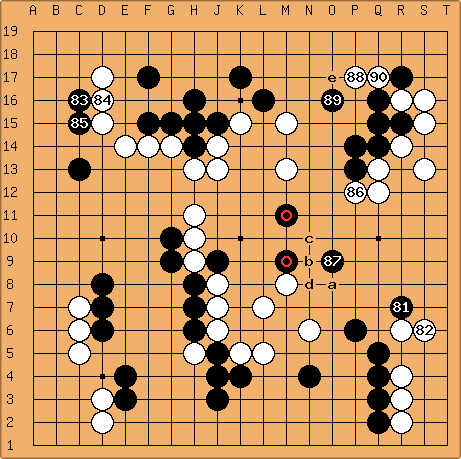 Now the black center group is unnecessarily heavy (this heaviness is of course better than the one caused in the actual game by , but connecting will surely still cost something), white is alive everywhere, C13 is weakened, and the extra aji at G5 is just begging to be utilized in an invasion on the lower side. 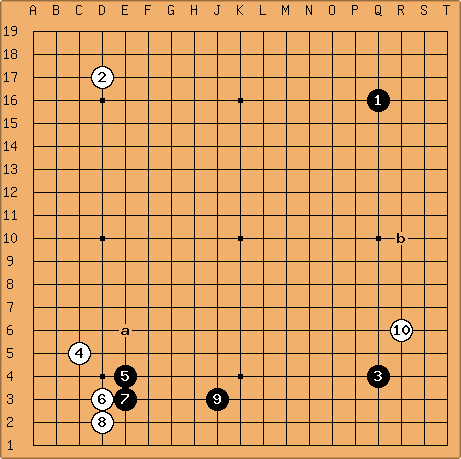 In exchange black gave up a couple of points in the center, and white gained a territory potential around F12. In simpler terms, the white reduction group is too strong to be attacked at all, so it makes no sense to save the cutting stone.